A Norwegian-flagged yacht known as the Berserk has gone missing off the coast of Antarctica after activating its emergency rescue beacon yesterday. The 14-meter, steel hulled ship was last known to be sailing rough seas in the Southern Ocean approximately 18 nautical miles north of the Scott Research Base and was believed to have been carrying as many as five passengers at the time. Rescues ships have been dispatched out of New Zealand to look for the missing yacht, but all attempts to contact the crew have failed and the emergency beacon is no longer transmitting its location. Bad weather in the region is hampering rescue efforts as well, with 75 knot winds and 6 to 8 meter swells reported in the vicinity. The ship is captained by Norwegian sailor Jarle Andhoey who is a seasoned skipper with years of experience under his belt. There were three other Norwegians and a British national on board the Berserk at one point, although two of the passengers may have been dropped off on the Antarctic continent to attempt a journey to the South Pole. Details as to who was exactly aboard the ship at the time of the distress call are still unknown. Weather conditions are expected to improve later in the day and search planes and helicopters may be employed to help find the missing the vessel. Rescuers are still holding out hope for good news, but considering the poor weather conditions and the loss of the signal from the ship’s beacon, the outlook is a bit grim at this time. American sailor Reid Stowe just finished an endurance test that beats pretty much anything on the high seas. He set off in a sailboat on April 21, 2007 and didn’t touch land again until he returned to port in Manhattan on Tuesday. That’s 1,152 days at sea. His girlfriend Soanya Ahmad, who had no previous open ocean sailing experience, joined him for the expedition but had to return to land after ten months because she was feeling seasick. That “seasickness” turned out to be morning sickness, and the first thing Stowe got to do once getting home was to greet his 23-month old son Darshen. Ms. Ahmad says she and Stowe agreed that he would continue the trip. Ahmad told the BBC that he would have gone back to sea sooner or later anyway. That’s one understanding woman, Stowe. You better keep her. Stowe had to fight hard to make his dream come true. He originally wanted to leave in 1992, but he had trouble finding funding. One of the reasons for the expedition was to simulate the isolation and stress of a Mars mission, which would take a similar amount of time. The original plan called for a crew of six to eight, the number generally agreed upon to make an effective interplanetary team. It seems Reid had trouble convincing others to join him so he set off with only his girlfriend. Reid kept his sanity by practicing yoga and writing a book. Maintaining a ship for that long without refitting took a major effort too. The Guinness Book of World Records is checking his claim and if verified, he’ll certainly become a new entry. Considering that he was tracked by GPS, things are looking good for Mr. Stowe. 14-year old Laura Dekker, who we first mentioned last year when she first announced that she hoped to circumnavigate the globe at the age of 13, has been denied permission to set sail once again. Yesterday, a Dutch court ruled that Dekker would remain a ward of the state until August 1st, and that conditions were not safe for her to set out on her journey at this time, much to the dismay of the teenager who hopes to break the record for the youngest person to sail solo around the world. Last August, the Dutch courts intervened in the girl’s plans, preventing her from sailing at that time. In December of last year, she ran away to St. Maarten in the Caribbean in the hopes that she could somehow get a boat there and begin the voyage on her own. When she was returned home to the Netherlands, child protective services took her under their care, and although she was allowed to live at home with her father, all major decisions regarding her welfare had to be approved by the government. Following her flight to St. Maarten, the court promised to review her case and give her a chance to demonstrate her skills as a sailor. Since that time, Laura has purchased a new, larger boat, and has taken it on several solo cruises, while also undergoing a battery of tests to provide proof of her ability to sail. Both of her parents are experienced sailors, and the girl was even born on a boat while at sea, so her technical skills are not in question. The current record for the youngest to sail solo around the world is held by Jessica Watson, who completed her journey last month, three days shy of her 17th birthday. Laura has said that she hopes to break that record, even if it is just by one day. That would give her more than two full years to make the journey, but for now, she won’t be able to get underway until at least August of this year. There is no indication if the recent struggles of American solo-sailor Abby Sunderland played a role in yesterday’s decision by the Dutch courts either. Jessica Watson likes to travel, but she approaches the concept a bit differently. The 16-year-old Australian just left Sydney Harbor today, and she wants to take on the world. Her goal is to sail 23,600 miles alone — through some of the toughest waters in the world — and become the youngest person in history to do so. The trek has kicked off some debate in Australia as to whether Watson’s parents are nuts for letting her attempt this (not a position that’s hard to imagine).The family claims that the kid is plenty salty and knows her way around a ship, and she’ll have radio and e-mail access. She’ll be blogging, too. 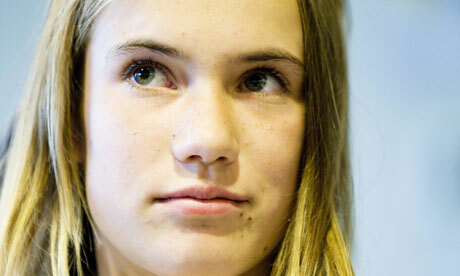 In the Netherlands, a pair parents disagreed on whether to let their 13-year-old daughter, Laura Dekker, attempt the same feat. A Dutch court put Dekker in the custody of childcare authorities while the parents fought it out. For Watson, just getting her pink, 34-foot yacht to the starting line has been difficult. Last week, she collided with a cargo ship while sailing to Sydney to make a few last preparations for her journey. And, strong winds last week prompted the sailor to push back her start date. There are two ways to categorize these around-the-world trips: assisted and unassisted. Watson is gunning for the latter. The youngest person to do this so far is Jesse Martin, also an Australian, who was 18 when he circled the world in 1999. To qualify as “unassisted,’ the vessel can’t take any new supplies, materials or equipment on board once the trip starts. Repairs can be made, but they must use stuff already on the yacht. The youngest circumnavigating sailor is Mike Perham, from Britain, who went 28,000 miles in nine months, but his trip counts as “assisted,” because he stopped for repairs. Zac Sunderland, from California, was a few months older than Perham when he completed the trip in 13 months, but his was also assisted.